The Colusa County sheriff has the responsibility and authority for all search and rescue activities within the boundaries of Colusa County. 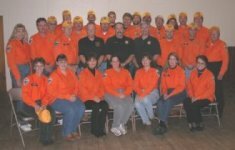 A rescue team was formed in 1984 to help provide these services. The team is composed of dedicated and trained civilian volunteers. The Search and Rescue Team (SAR) has been involved in various missions, from searching for lost children, motorcyclists, and hunters to rescuing victims of plane crashes. SAR is also used for evidence searches in major crimes. The SAR team operates an aid station to assist outdoor enthusiasts on major holiday weekends. The SAR team also has members certified to teach the Hug-a-Tree program, an outdoor survival presentation for school-aged children. For more information about the search and rescue team, please contact the sheriff's office at (530) 458-0200.